The Church Street and Frogham forges. The Church Street forge in Nonington. Early inns and alehouses often had a smithy adjoining or nearby and the old “White Horse” alehouse buildings, now Church House next to St. Mary’s Church in Church Street (now Pinner’s Lane), probably date back to the mid to late 1500’s or earlier and occupied a central position in the old parish of Nonington next to the church and on an important cross-roads. The village black smith played a vital part in village life, in addition to shoeing horses the smith made the metal items needed for everyday living and working. James Knott, smith and house holder, was buried on June 19th, 1600, having previously married Anne Pollarde on May 12th, 1595, and may well have been the smith at the Church Street forge as records of the “White Horse” date back to this time. Nonington Church and environs, extract from the 1859 Poor Law Commissioners parish map. When William Hammond, a member of the family that owned St. Alban’s Court, bought “The White Horse” from the heirs of Thomas Pettit in 1700 the property consisted of “all that messuage or tenement with the barns stables smiths forge buildings courtyards gardens and all that part or parcell of arable land enjoining by estimation two acres more or less” indicating there had probably been a forge there for some time prior to the sale as stable buildings are mentioned in a 1659 sale document. 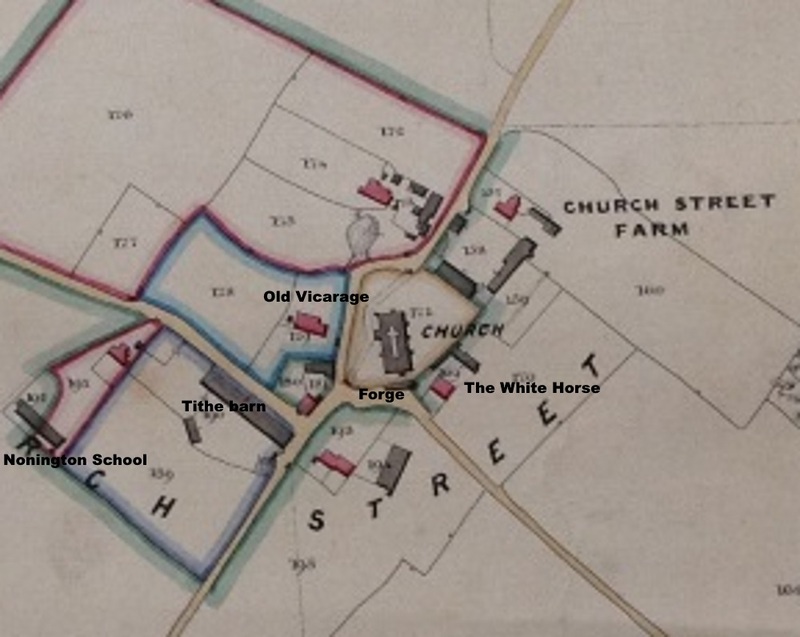 However, when the premises were sold by Mrs. Elizabeth Beake, the heiress of the late William Hammond, to William Hammond of St. Albans Court in the 1750’s they had been divided into “that messuage or tenement situated at Nonington in a place there called Church Street and called or known by the name of the White Horse with outhouses buildings orchards gardens about half acre” and “a smiths forge” occupying about half an acre and consisting of “stables outhouses yards gardens backsides and lands” in the tenure of Henry Spain, the son of Christopher Spain, the previous blacksmith. The Spains continued as blacksmiths here until 1801 when Andrew Morgan took over the the forge and in 1832 he took over the “White Horse” premises when the alehouse closed. The Morgan family worked the forge throughout the 1800’s and became blacksmiths and veterinary surgeons in the later part of the century. They gave up blacksmithing in the early 1900’s but continued for some years as veterinary surgeons. The picture on the right is a 1920 portrait, possibly a trade card, of Charles Morgan, vetinary, and the last of the Morgans to run the blacksmith’s business at the Church Street forge. In his 1930’s memoirs Richard Jarvis Arnold (see page 2), an elderly Nonington born Walmer blacksmith described his apprenticing in 1887 to Charles Morgan, blacksmith and veterinary surgeon. At that time“ three men and two apprentices were then employed there and that there was a good amount of work from the farms of Nonington and the surrounding villages”. Oscar Vernon Gunning, M.R.C.V.S., was listed in the 1922 Kelly’s Directory as veterinary surgeon and shoeing and jobbing blacksmith at Church House, and not long after was succeeded by George Cork who worked the forge assisted by George Henry Beer who in turn took over the forge to become the last full time blacksmith at the Church Street forge, working there until just after the start of the Second World War. George Beer was known as “Sniffer” because of his frequent sniffing. Many villagers believed this was the result of his having been gassed in the Great War, but was actually caused by a broken nose received in an accident. “Details about my Dad and his sniffing are as follows: I suppose it would have been when he was a teenager, he with some of his brother’s, or mates, were messing about with some workman’s tools,[I think he mentioned it was a pick axe] that were being used to dig a trench, up Butcher’s Alley, somehow my Dad got hit in the face and it broke his nose, which was never set properly, he also suffered later in life with catarrh which left him with this permanent sniff. “Dad had the forge at Nonington from 1930-1940, he closed it due to lack of business, farm machinery was becoming mechanized, although he could turn his hand to many things to do with metal, I think the main work would have been shoeing horses, and when these animals started to disappear, so did the business, he also repaired and renovated machinery that was not mechanized, but there was not enough of this to make the business profitable so he closed down. The key was handed to the elder Scothorn [at Church House, (later the dairy and now a private house)] who bought the building when it was sold off as part of the St Albans Estate sale sometime between 1935-1938 (the sale was in 1938). After George Beer left the forge some part-time blacksmithing was carried out by a Mr. Dixon until the early 1950’s when it finally closed. The forge building survived for some years but was unfortunately hastily demolished by its then owner at the end of the 1950’s. Frogham forge, 1859 Poor Law Commissioners map. 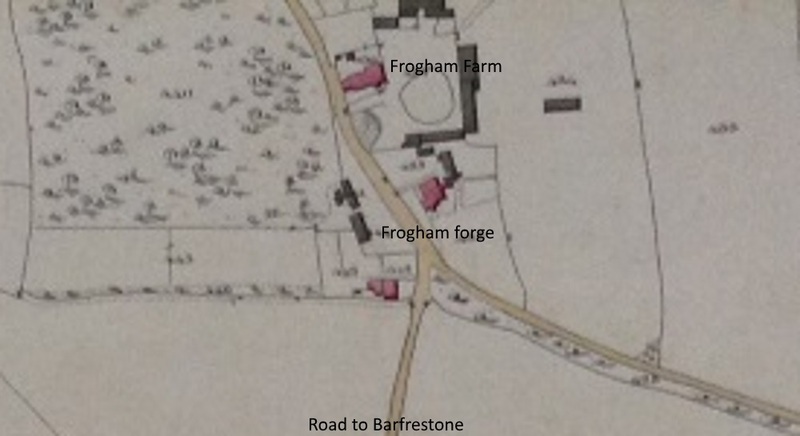 On the 1839 and 1859 Nonington parish tithe maps and the 1870’s Ordnance Survey map the Frogham forge or smithy is shown occupying the roughly triangular piece of ground next to the thatched cottage at the of bottom of the hill leading from Frogham to Barfreston. William Abbot, the smith listed in both 1839 and 1859 tithe apportionments and in the 1861 census, was recorded as paying parish rates for a forge from a much earlier date and although the site of his forge is not specifically identified it was almost certainly on this site. 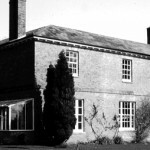 After William Abbot’s tenure the Frogham forge was run by members of the Friend family who lived in the adjacent cottage. The 1891 census recorded Robert Friend as the blacksmith who, along with his wife Mary and their five children, lived next door to the forge, but soon after the census the payment of parish rates for the smithy ceased, an indication that the blacksmith’s had ceased trading. I would like to know more about the Morgan family in Nonington and where they came from? Sorry, I’ve no information about the Morgan family. My family, the Spain’s were also part of the forges in 1600’s. I would love to see more photos if any come to light! If I can find any I’ll put them on the site.